As part of Elise Greenberg’s internship at the Lloyd Center this past summer, she initiated a “butterfly survey” of the Slocum River Reserve, which is jointly owned by the Trustees of Reservations and the Dartmouth Natural Resources Trust. This project is part of the Lloyd Center’s Southcoast Biodiversity Initiative, a five-year plan to conduct an inventory of the natural resources of the Slocum/Paskamansett River watersheds as to establish baseline information upon which climate-change impacts can be evaluated. This project is funded in part by the Motorola Solutions Foundation and the Dominion Foundation. “I just don’t see butterflies the way I used to!” I keep hearing this from people from urban, suburban and rural settings. Commercial and residential development, expansive green lawns and hybrid flowers which produce little or no nectar, are some of the main culprits, but reforestation has also played a major role. 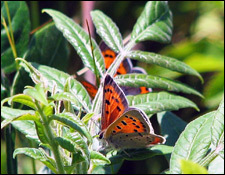 In terms of numbers and diversity, woodland settings host fewer butterflies, many of which spend much of their time in the treetops out of ground level view. A hundred or more years ago, the rural landscape was both farmed and logged, resulting in a mosaic of successional habitats. Although the population of butterflies characterized as “forest specialists” likely declined, some of our showier species (‘sulphurs’, ‘monarchs’, ‘swallowtails’) likely flourished in this setting. The Slocum River Reserve and the surrounding farmlands are a microcosm of this past landscape. Starting on July 3 (already halfway through the butterfly season), Elise conducted butterfly surveys throughout her summer internship which I continued through October 27, resulting in ten surveys conducted. A total of 34 species (see Table) were seen despite our having missed all the spring-flying species. It is likely that 50 or more species would be identified during a season-long inventory, nearly half the number of unknown species to be in Massachusetts. What was more impressive than the number of species was the abundance of ‘sulphurs’ (thanks to the alfalfa fields), “monarchs”, “painted ladys” and “american coppers”. The glades and clearings on the property are carpeted with a rich diversity of nectar sources (red clover, milkweed, dogbane, asters, goldenrods, mustards, hawkweeds, to name a few), resulting in a changing, but uninterrupted, source of food as the season progressed. Fellow Lloyd Center intern Matt Burrows and I accompanied Elise on her final surveys. Shortly into our journey, I spotted a large (VERY large) dark brown and yellow butterfly as it was visiting the goldenrods, which I immediately recognized as a “giant swallowtail” – a first for me in 50+ years of studying Massachusetts butterflies, and me without a camera! I asked Elise and Matt to keep an eye on it while I ran back to the car for my camera, of course the butterfly was gone when I got back. Matt said that he knew this butterfly was something special as I had uttered a phrase he had not heard from me before! Upon regaining my composure, I thought that if there is a “giant swallowtail” here, perhaps a wave of them had moved north. Sylvan Nurseries, with its cornucopia of nectar sources, might possibly be a likely source to see another. I ignored the “yeah, right” eye-rolls of my interns and proceeded down Horseneck Road at breakneck speed to the nursery. Upon arriving, we stated our mission at the front desk and proceeded toward the “buddleias”. As we reached the tall phlox, what should appear? Not one, but two “giant swallowtails” avidly nectaring at the pale pink and the orange-red varieties of the tall phlox. Armed with my camera this time, its presence was recorded for posterity. The “giant swallowtail” is one of many southern species increasingly seen in Massachusetts. Some, like the “cloudless sulphur” seen at the Reserve are at the end of a one-way trip, unable to survive our winters in any stage. Others, like the “giant swallowtail” or the recently established “zabulon skipper”, also seen at the Slocum River Reserve, may now be resident in Massachusetts. One does not need to see any of these specialties, however, to enjoy the rich diversity and abundance of butterflies at the Reserve. So, while enjoying the fine sculptures well integrated in to the landscape, I urge all to take time to observe the local residents flitting about as well!